Copyright 2007, Yelena Pancheshnikov. Used with permission. A collection of three closely related non-bibliographic databases recently became available through Cambridge Scientific Abstracts. They are: COS (Community of Science) Scholar Universe, COS Funding Opportunities and PapersInvited. The three databases support research by aggregating information about scholars, funding sources and publishing opportunities in various subject areas. COS is a division of Cambridge Scientific Abstracts. 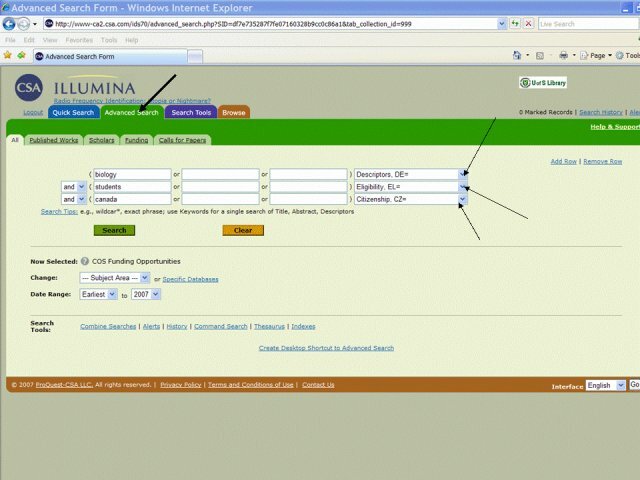 At this time all of the three databases are available on the CSA Illumina platform that is familiar to users as an interface used for numerous bibliographic resources. 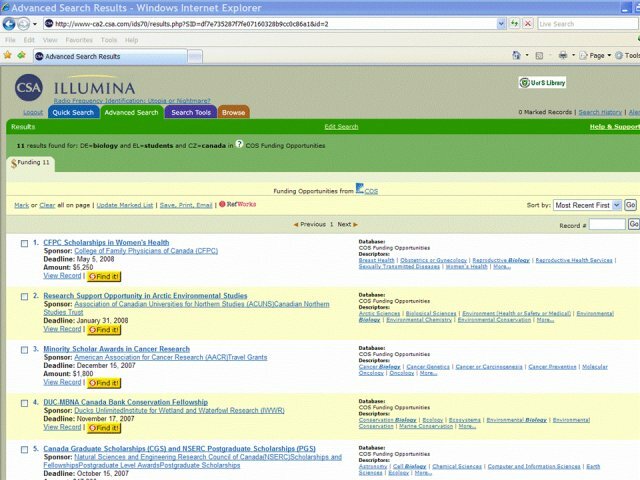 Initially, only COS Scholar Universe and COS Funding Opportunities were accessible on the Illumina Platform. 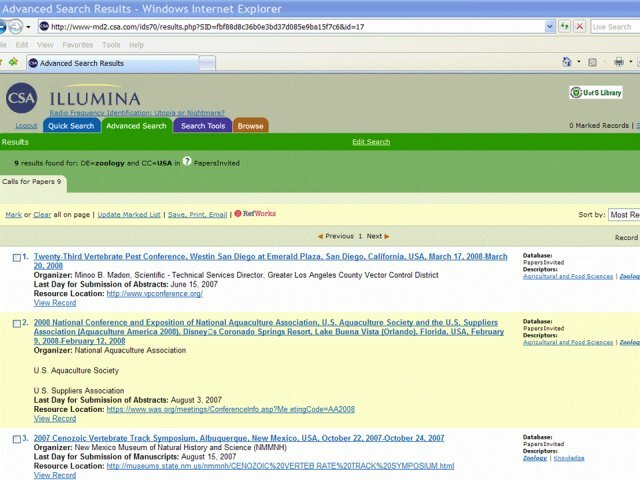 The PapersInvited database used a different interface, but has recently migrated to Illumina. The original interface is still available. COS Scholar Universe contains records of individual scholars and organizations in order to provide quick and easy access to information about individual researchers and organizations around the world -- and most importantly -- to find researchers by the area of their specialization. The database icludes records of over 1.3 million scholars working at 4,920 universities in different countries. The subject coverage is very comprehensive and includes all areas of the sciences, social sciences, humanities and art subdivided into over 200 disciplines. The database is updated monthly. 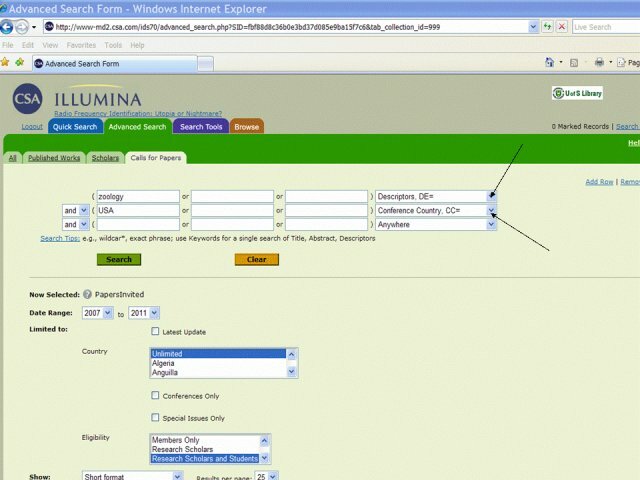 The Illumina interface enables searching in both quick and advanced modules. The latter permits searching by several criteria, the most functional of which are interests (area of specialization), country, and affiliation. Profiles of individual researchers are detailed and contain contact information, biographical and bibliographical information, as well as links to a researcher's curriculum vita and personal web site. Lists of publications are compiled based on verified information available in a broad range of the CSA proprietary databases. Peer-reviewed publications are listed separately. 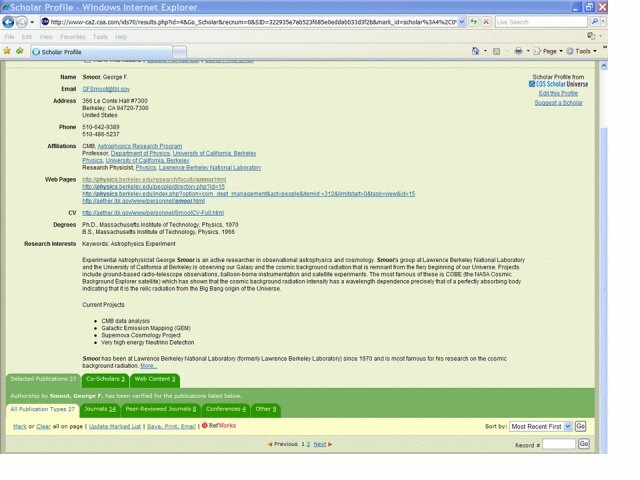 Profiles of organizations include contact information, lists of members, and links to the organization web page. 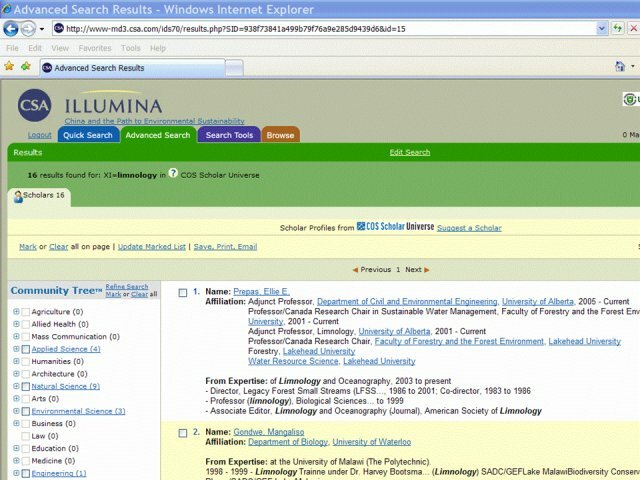 A trial search for scholars working in the field of limnology in Ontario, Canada done in the advanced mode by a combination of the "Interest," "Scholar Country," and "Canadian Provinces" fields selected from the drop-down menu retrieved records of scientists working in different departments at universities in Ontario. The results illustrate the effectiveness of the database for interdisciplinary areas. (See Figure 1 and Figure 2). The idea of creating a comprehensive and easily searchable resource that allows quick access to information about researchers all over the world has obvious potential. The number of fields in the individual records illustrates a comprehensive approach to the collection of information. One can expect that the database will serve as a starting point for students, researchers at early stages of their careers, scientists working in interdisciplinary areas, as well as to numerous practitioners who require background information about academics in the field of their work. At this point, however, the database requires improvement. It can be recommended to a fairly broad clientele, but should be used with reservations. COS Funding Opportunities is a database of available grants, fellowships, prizes, and other types of funding available in a broad range of disciplines to recipients anywhere in the world. Opportunity sponsors come from both the public and private sectors, and include local, state and national governments, foundations and societies, and corporations. The database contains more than 22,000 records worth over $33 billion. Searching can be done in either the simple or advanced modules. The advanced module enables exceptionally precise and detailed searches based on numerous fields included in the records of individual funds. Among the most functional fields are: descriptors, citizenship, eligibility, requirements, deadline, and sponsor. Descriptors specify the subject area to which funding applies. The number of descriptors assigned to each record varies from one or two to over 10. Access to a broad range of descriptors through individual records allows a searcher to rerun broader searches and retrieve information about very specialized grants. A trial search for funding and grant opportunities in biology available to Canadian students was done in the advanced mode by a combination of the descriptor field, citizenship, and eligibility. (See Figures 4 and 5). Additional search tools include several indexes and an alert service. Indexes provide access to a complete list of descriptors, funding types, sponsor types, and requirements. The Funding Alert delivers weekly updates directly to the user's desktop based on specific criteria the user defines. Weekly updates include the title, sponsor, deadline, and amount. The database also continues to be available on its original COS platform. The original version is designed to serve large research organizations, such as university research departments and independent research institutions. It is complemented by COS Expertise -- a service that enables research institutions and other organizations to manage and promote their roster of faculty and staff. The database is exceptionally comprehensive, covers practically all subject areas and types of resources. It can undoubtedly be recommended to any academic library as a very functional resource important to any group of users from students to experienced researchers. PapersInvited is a database of calls for conference papers, posters, and journal publications that are issued by various conference organizers, professional bodies, and journal editors. It provides information on publishing opportunities via conference proceedings and special issues of journals. The database has a worldwide coverage of all subject areas and is designed for researchers at all levels, as well as for students. Approximately 10,000 conferences and 1,200-1,500 special issues are listed each year. Currently listed records represent events that are scheduled; past events are removed from the database. The database is updated three times per month, with at least 200 new records added each time. PapersInvited is currently available on two platforms: on its original platform and, lately on the Illumina platform. 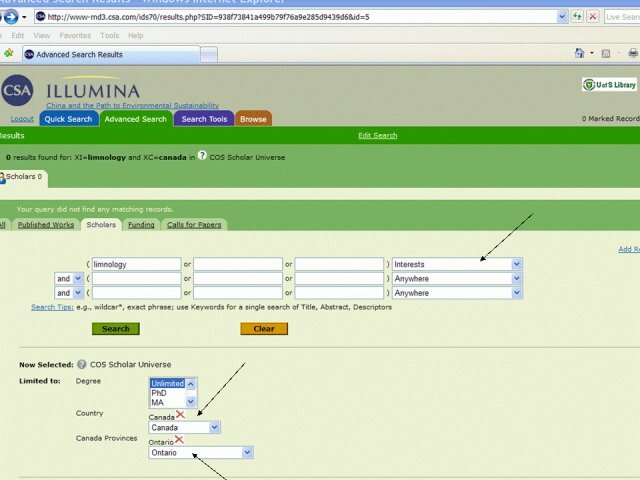 Searching PapersInvited on the Illumina Platform -- like the two COS databases described above -- can be done in the quick and advanced modules. The latter is based on a combination of numerous fields included into individual records. The most functional and frequently used fields are: keywords, descriptors, conference country, conference location, publication information, publisher, and dates. Information about each event and publication is detailed and includes information on session tracks, poster sessions, and workshops, as well as contact information and URL links to organizers and publishers. A trial search for calls for conferences papers in zoology held in the United States was done in the advanced mode by a combination of the descriptor and country field. (See Figures 6 and 7). Additional search tools include indexes that are available for the following fields: Acronym, Conference Title, Descriptors, Journal Name, and Organizer. The original platform of the database is quite different. In addition to standard ways of searching, it allows easy browsing by making several functional features of the database very visible. (See Figure 8). These features include the Calendar, Specialization, Student Corner and Submission Information. The Calendar displays all of the events occurring on a particular day and week and lists conferences with abstracts due on the day the database is accessed. It can be quickly and easily navigated. The Specialization section displays a list of broad subjects and lists of related upcoming events. Student Corner is a section that aggregates information about various opportunities offered specifically to students starting at the Bachelor's level. The listed events and opportunities for students are very broad and even include volunteering positions. 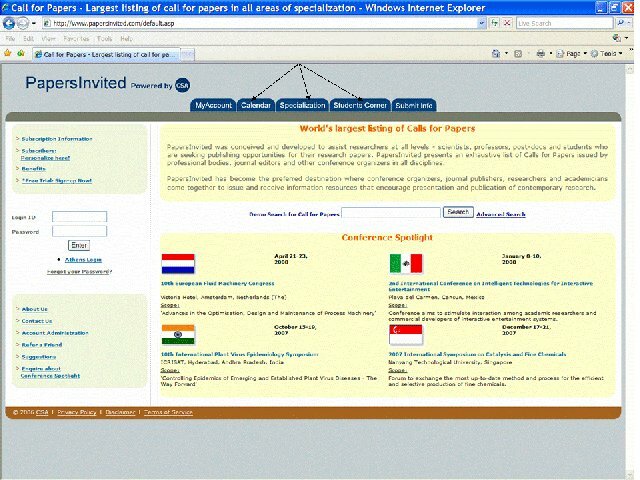 The "Submit Information" section provides an opportunity for organizers of events, as well as people who came across relevant information that was not listed in the database to add information in any of the forms identified by the database (papers, posters, publications, student competitions). The original platform also offers several personalization features such as MyAccount, MyCalendar, MyFavorites and MyPlanner. The "MyCalendar" page displays the abstract submission dates and upcoming conferences only in the areas of specialization chosen by the user. "MyFavorites" is a folder that enables quick tracking of events of interest by copying calls for papers in areas of interest into a separate listing. "MyPlanner" is a section where submission information for conferences chosen by the user is added and pictorially displayed on a monthly planner. "MyPlanner" also displays holidays of any two countries the user chooses. E-mail alerts are an important feature of PapersInvited on both platforms. Calls for papers for conference presentations and special issues of journals in the areas of specialization chosen at the stage of registration are sent to the user inbox after every update. All of the three database aggregate valuable information and can be recommended to any academic institution. Having all of them on one platform has obvious advantages.